City University of New York’s (CUNY) Office of Library Services (OLS) leads the effort at three community colleges to transform associates degree programs through Achieving the Dream’s (ATD) OER Degree Initiative. All the courses in the degree pathways have been redesigned to replace traditional commercial textbooks with open educational resources. Borough of Manhattan Community College has created a degree in criminal justice, Hostos an early childhood education degree, and Bronx Community College has a general education degree with a concentration in History. The visibility of our participation in the ATD grant lead to significant New York State funding in FY18 and FY19. The libraries of CUNY have long been concerned with the cost of education for students, especially textbooks. Almost 60% of City University of New York (CUNY) students have household incomes less than $30,000 and over 60% are Pell grant recipients. Librarians are acutely aware of this problem since they purchase many texts for reserve to ease the burden on their students. Grassroots initiatives started in 2014 when some of the libraries started using textbook funds to create modest OER initiatives. When Achieving the Dream’s OER grant opportunity came along the Office of Library Services (OLS) coordinated the proposal effort with the three participating colleges. In addition to the significant and much needed cost savings for students, evidence suggests that OER will contribute to student success, increasing retention and completion and reducing D, F and withdraw (DFW) rates. Initial results indicate that OER have the potential to impact student success not just through cost savings, but also through their pedagogical richness. Many faculty don’t just replace the commercial textbook with an open textbook, they also expand the materials they use incorporating more current and diverse sources, including multimedia. There has also been observed a growing trend among faculty who were curating materials for their classes because the proprietary offerings in textbooks were not appropriate for students at community colleges and lacked cultural and social relevance. Time was a challenging constraint, as CUNY community college faculty are required to produce scholarship, as well as to engage in service activities and teach a 5/4 load. Ideally, faculty would be released from a course to provide adequate time to redesign their courses with OER, but the grant funding wasn’t enough to cover course releases. While faculty appreciated the stipends that were provided, these did not free up the time they needed for the course redesign. It was also difficult to find replacements for faculty who left the project. Several faculty librarians were asked to support the initiative, however, they did not receive release time and the additional work impacted on their scholarship, service, and librarianship responsibilities. There was a mild level of confusion regarding the parameters of open licensing and what was permissible under the grant guidelines. The grant required that all the courses be reviewed and approved as completely openly licensed. This was a stumbling block for many faculty and slowed the progress. There continues to be much conversation around what is OER; strictly openly licensed materials or can an OER course also include proprietary materials owned by the university such as library materials? There are many courses where a combination of OER and other no-cost materials provide a pedagogically rich experience for students, and many faculty lean toward this zero cost model rather than pure OER. After the initial excitement of receiving the ATD grant, it was challenging to figure out how to build expertise on the campus level with sensitivity to the particular culture of the campus. It became clear early on that there needed to be someone on each campus who “owned” the project and could do outreach and advocate and also act as an expert. This requires reconfiguring or adding job titles and possibly personnel. The three participating CUNY colleges have very different cultures which required different strategies for engaging faculty and other constituents. At Borough of Manhattan Community College, the administration already fully supported an open/alternative textbook program that provided faculty development for redesigning courses with no-cost materials including OER. Faculty were on board for zero textbook cost courses but needed to transition to OER-only courses. For many Bronx Community College faculty members, the Achieving the Dream and CUNY zero textbook cost (ZTC) initiatives, as well as the related administrative support, represented their first contact with the concept of open educational resources (OER) and ZTC. This top-down encouragement to embrace and produce OER may initially have impeded interest and adoption, but as faculty have learned more about OER and seen how colleagues have transformed their courses, genuine enthusiasm has replaced wariness. In addition to addressing cost considerations, faculty are now employing OER and ZTC materials in their efforts to provide students with more meaningful and equitable learning experiences. Hostos Community College joined the OER movement late. Although a few faculty were engaged in using OER, the structure or knowledge base was not in place to be effective. Achieving the Dream’s grant spurred faculty interest across campus towards developing OER. Stakeholders from students to administrators are interested in zero cost content, but also in the opportunity to expand course content beyond the standard proprietary textbook to more engaging resources. Faculty had been waiting for such an opportunity and it has lead to working beyond academics to include student support services and continuing education. For those interested in learning more about OER, informational workshops, a how-to guide, and one-on-one consultations are available. Usually, outreach to students begins with student government associations (SGA), but this had mixed results on our campuses, as the SGA has annual turnover making it difficult to sustain a campaign. CUNY Office of Library Services was instrumental in producing publicity materials (e.g., flyers, videos), which were used for tabling at events and put on bulletin boards. Advisors are also key players in getting the word out to students about the OER courses, especially that there is a search option for Zero Textbook Cost sections when registering for courses. A short video was created to educate students about OER and its benefits. Since participating in the ATD grant, New York State funding has allowed the CUNY system to vastly grow the OER initiative. This current fall 2018 semester over 3,000 OER course sections are running, saving students nearly $10 million in that one semester alone. Anecdotally, there is much conversation around the reinvigoration of teaching and engagement between faculty and students. CUNY has developed a relationship with their sister institution in New York State (SUNY), collaborating and aligning their goals. 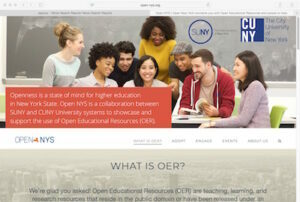 A jointly developed website has been produced to grow a community of practice around the discovery, use, and creation of OER at SUNY/CUNY. With the implementation of OER, a renewed conversation has emerged about how faculty document and present for reappointment, tenure, and promotion. This has also brought to the forefront other pedagogical strategies such as asynchronous, hybrid, service learning, etc. Expertise and leadership on the campuses as well as administrative support is key to the success of the initiative. Also important is a combination of grassroots commitment and engagement from faculty and students and top-down funding from administrators. While one of these may precede the other, both are important for sustaining and growing OER degrees and initiatives. Concerns and conversations about sustainability continue. How to redirect or repurpose funding for continuing the work? While funding to provide the professional development needed for faculty engaged in this work (including OER librarians and instructional designers) is critical, the bulk of the work is done by faculty themselves as they reconceive and redesign their courses with OER and, ideally, open pedagogy. It’s unrealistic to believe there will be funding going forward for the course release needed to provide the time faculty require to do this work. Instead, CUNY needs to have discussions on their campuses about how this work can be valued and counted in tenure and promotion. When OER course redesign is part of tenure and promotion, faculty can choose to spend time on this activity. For example, if one campus counts OER course redesign as service, a faculty member could choose to redesign one of their courses rather than serving on one or more committees in a particular semester or year. On another campus, OER course redesign might be considered scholarship (e.g., under Boyer’s scholarship of integration), and a faculty member could choose to do OER work rather than a research study they had been planning. Because funding in higher education is always tenuous, campuses need to make progress while the funding is available, but look for opportunities within policy, especially tenure and promotion policy, to sustain and scale OER programs.